Does Peergrade have an app? Peergrade does not offer a native app that can be downloaded from the App Store or Google Play. However, you can save Peergrade to your home screen on both iOS and Android. 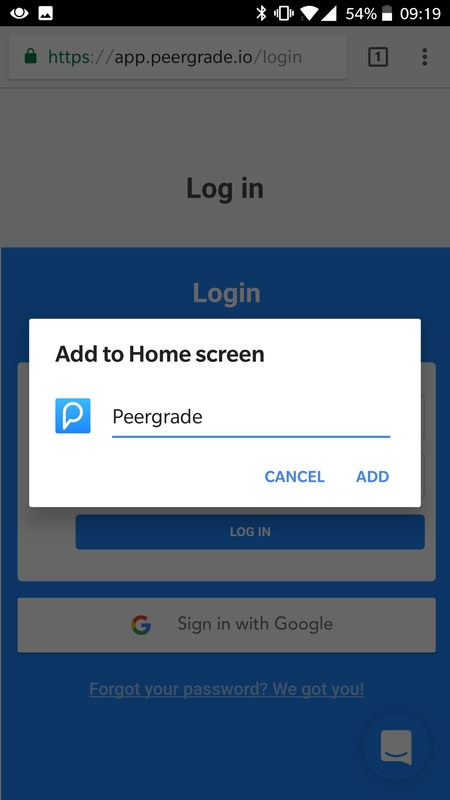 This will make Peergrade seem like a real application that takes up all space on the screen without any browser chrome and give you an app icon on your home screen to access Peergrade from. Open Chrome and go to www.peergrade.io/login. If you are already logged in to Peergrade you need to log out first. When you are on the login screen tab the three dots in the top right corner and click Add to Home screen. Peergrade is now accessible on your home screen like a normal app. Open Safari and go to www.peergrade.io/login. If you are already logged in to Peergrade you need to log out first. When you are on the login screen tab the icon in the middle on your tab bar and click Add to Home screen.